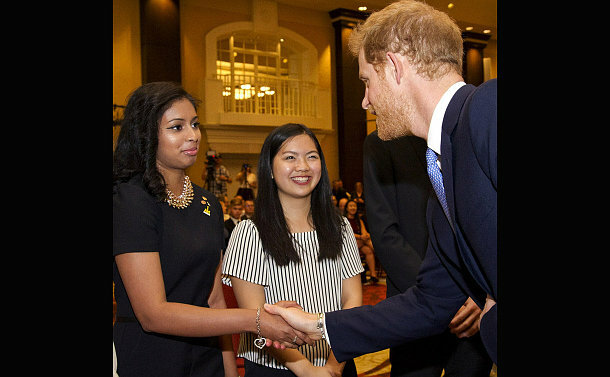 A Toronto Police Youth in Policing Initiative (YIPI) graduate had the honour of meeting Prince Harry at the Duke of Edinburgh Gold Award ceremony at the Fairmont Royal York hotel on September 23. It was a special occasion for University of Ottawa second-year student Bibi Hakim, who holds him in high esteem. Prince Harry was in Toronto last week for the Invictus Games that he launched three years ago. Hakim was selected to address the Prince and other guests at the event, where 150 young people were presented with their Gold Awards. “I couldn’t believe it when I got the invitation and I sent a few emails just to confirm,” the 2015 YIPI valedictorian pointed out. Hakim was introduced to the program in Grade nine at North Albion Collegiate Institute by geography teacher Marty Munchinsky. He and Staff Sergeant Ron Boyce were among Hakim’s special guests at the event. Boyce, assigned to 52 Division, was honoured to be invited. 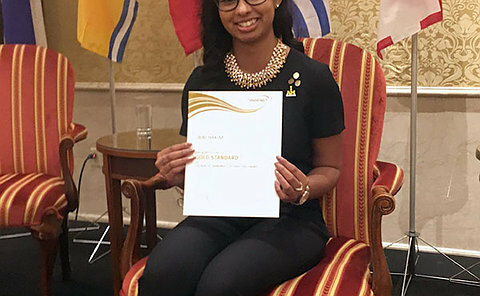 Founded by Prince Philip in 1963, the Duke of Edinburgh International Award is a global program that challenges, empowers and recognizes youth between 14 and 24. More than 500,000 Canadians have taken the challenge, which has bronze, silver and gold levels of the award. “Each level brought new and exciting challenges,” said Hakim, pursuing political science and public administration studies. “Trying to overcome bullying in Grade nine, I made new friends, went camping for the first time and overcame shyness in the six months I spent at the bronze level. During my two years at the silver stage, I pushed my physical capabilities and made it on the ultimate Frisbee team. I also played volleyball and football. During the final gold stage, I tutored young children and taught them the importance of giving back to their communities.